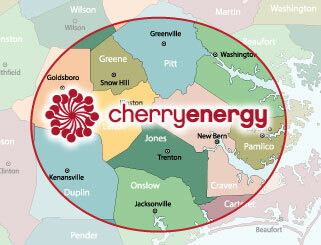 To get the propane you need, when and where you need it, trust the experts at Cherry Energy. We make propane delivery in NC easy. From our friendly customer service reps to our certified drivers, Cherry Energy is committed to serving you with safe, timely and reliable delivery of high-quality propane for your home. Auto-Fill – We track usage and schedule deliveries for you. Auto-Fill customers receive our best prices, and tank sizes (250 gallons or more) are covered by our “no-run-out-policy”. Level Payment Plan – Make monthly payments throughout the year instead of paying for your winter deliveries all at once. Price Cap – Our most popular pricing option, which acts like an insurance policy. It sets a cap on your price to guarantee you won’t have to pay more than that amount for the entire heating season. This year our price cap is $29, which can be spread out on your Level Payment Plan for just $2.40 per month. Season Prebuy – Lock in a price for the entire heating season and purchase up to 100% of the gallons that were consumed in the prior year. For propane delivery backed by 80-plus years of experience, trust the experts at Cherry Energy – North Carolina’s source for all your propane needs. Contact us today to join the Cherry Energy family as a propane customer – or simply fill out our online customer application, and we’ll get back to you shortly to set up your account.